BLOOMINGTON – The problem with losing seven games in a row, as Indiana did in January, is that it eliminates any room for error. If the Hoosiers had been able to win a few of those games (against Northwestern and Rutgers, say), they would have been able to take something of a moral victory from Thursday's loss against No. 20 Iowa. Archie Miller made clear he thought his team played well in the 77-72 loss to the Hawkeyes and he liked the group's energy. I agree; the Hoosiers played hard from the opening tip and were in the game at the end despite the Hawkeyes hitting a series of devastatingly difficult shots against solid defense. The problem is, that seven-game losing streak means there are no more moral victories this season, unless we're talking about building for next year. As far as this season goes, tonight was just another missed opportunity against a good team at home. The Hoosiers still have three of those left – against Purdue, Wisconsin and Michigan State – but they can't afford to let any winnable games slip away. 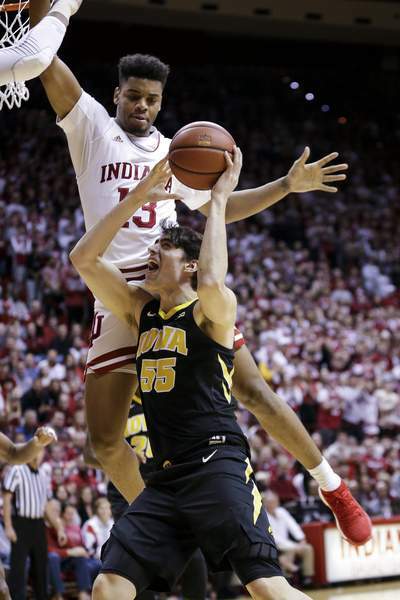 If Indiana ends up on the wrong side of the NCAA Tournament, falling short against Iowa on a night the Hoosiers played well enough to win might stand out as an important reason why. To be clear, however, there were positive signs for the future in this game. Romeo Langford played one of his best games in weeks, scoring 22 points on 7 of 12 from the field and hitting three 3-pointers on seven attempts. He scored 15 of those points in the second half, when he was aggressive, smart and tough. The Hoosiers desperately need more of that from Langford, who spent a good portion of the first half floating around the perimeter. "He is phenomenal," Iowa coach Fran McCaffery said of Langford. "The kid has got unbelievable skill, but I think it’s his confidence level. You talk about a guy that plays at his pace. Can you get a quiet 22? He got a quiet 22 (points). He doesn’t force anything. He goes off the dribble, makes threes and gets to the free throw line. He impacts the game in a lot of ways. They go to him late. He is a late-game guy. "We were up (76-70), and then he hits the big 3 (with 23 seconds left). You’re not surprised. We know that’s where they are going, and he makes it anyway. That says a lot about him. He is special." The Hoosiers also saw once again how much of a force De'Ron Davis can be when he's healthy. Davis was magnificent in a number of ways, battling fatigue to put up seven assists and zero turnovers. He only scored four points, but all four came at key junctures late in the second half. His passing was an important reason the Hoosiers were able to solve Iowa's zone; seemingly every time he touched the ball in the middle of that defense he made a smart pass. "He's just another big body, he's a physical post presence for us," Morgan said of Davis. "He has a great feel for the game. He knows where guys are, he doesn't force anything. He just takes his time in there, finds open guys and makes the right pass." Davis was especially important because Morgan picked up his fourth foul with 16:45 remaining and was only able to play 22 minutes. The senior forward has struggled with foul trouble this season and having Davis there to step in is a huge upgrade over the Hoosiers' other reserve big men. It was also encouraging to see Morgan's play when he was on the court. He seemed to show no ill-effects from his shoulder injury against Michigan State and scored 17 points on 7-of-9 shooting. If he hadn't gotten into foul trouble, he might have been able to push the Hoosiers over the hump in tandem with Davis and Langford. As it was, he showed that the injury won't slow him down as he tries to reach the NCAA Tournament for the first time since his freshman year. The Hoosiers will still have plenty of opportunities down the stretch to prove they're worthy of a tournament berth, but tonight was one they should have seized. They came up short and the schedule is shrinking rapidly.